Mosquitoes is a natural disaster for gardeners. Little annoying insects make summer holidays in a relentless struggle. You have to systematically handle skin and clothing to somehow protect themselves from the bites, which are accompanied by prolonged itching. 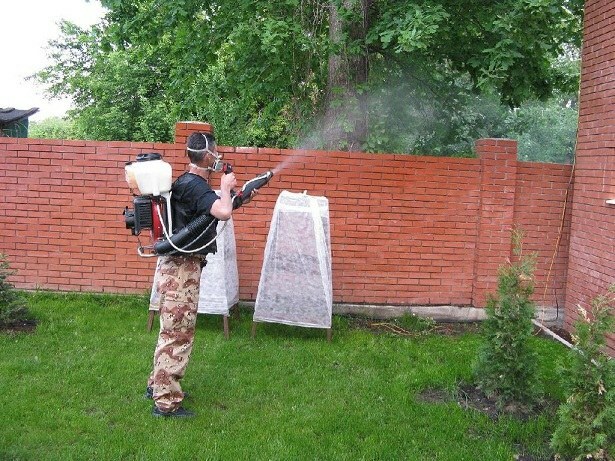 Modern means means is able to destroy mosquitoes and their larvae over large areas. Process the cottage or garden, territory of the garden Association, recreation areas, pioneer camps, rest houses, sanatoriums, using the means of the drug "Cifax" and more modern means, Medelis-Cipher". Domestic drugs help to destroy mosquitoes and their larvae, but all of synanthropic arthropods that cause people lots of trouble. With the help of these funds you can get rid of flies, mosquitoes, fleas, ants, ticks. Disinfestation is carried out in the centers of the spread of scabies, lice. Drugs produced in plastic and glass bottles with volume from 10 up to 250 ml for individual use and 5 liters for the mass extermination of insects over large areas. To prepare the solution and use you need to carefully read the instructions from the manufacturer and use strictly in recommended doses. The toxicity of drugs belongs to the third class of danger and is characterized by a moderately dangerous to humans and animals. For the treatment plots, you can call specialists from the sanitary epidemiological stations, or private services. If you personal a country or a plot do not want to use chemicals, get rid of a large infestation of mosquitoes by using planting, which is a smell that insects can't stand. The best result is achieved when planting bird cherry, Basil, chamomile, marigold. This method is less effective than the use of chemicals, but it has the advantage of absolute safety. In the fight against mosquitoes it is necessary to apply all available methods. Promptly remove the weeds, mow grass, close containers of water to thin out the crowns of the trees to prevent excessive shading of the site.